I think we can all agree that kids toys tend to get a bad rap. This post is about to change all that! Known for their impossibly bright colours and often less-than-subtle design, kids toys can become an eyesore in your living space as they find their way outside the playroom (if you are lucky enough to have one). But friends, it doesn’t have to be that way. Constantly hiding toys doesn’t have to be the norm. Believe it or not, you’ll find quite a few beautiful pieces for your kids if you look in just the right places. I’m talking toys you’ll actually want to leave out when guests stop over. And toys that blend with your design aesthetic in the most seamless fashion. Where do you find these unicorn toys, you ask? They’re right here in my roundup sorted by colour to suit every taste and style. Browse for your favourites, PIN THEM and kiss those toy battles goodbye. Note to all design-savvy parents: you can never go wrong with natural wood. Whether it’s baby teethers, toddler blocks, or big kid puzzles, wood tones complement any color palette and provide a timeless sense of style. I also love that you can pass these down for generations to come. 01. // Riga Roo Rocker; 02. // Tegu Magbot; 03. // Hippo Ride On; 04. // Stacking Wheels Toy; 05. // Percussion Set; 06. // KEVA; 07. // Puzzle; 08. // Mozartkugel Music Box; 09. // Castle Box; 10. // Goose Toy Figure; 11. // Doll House; 12. // Cubebot; 13. // Story Car 14. // Baby Teethers. I love colour, especially in tones that blend with our own home decor. Strike just the right balance with muted tones like soft pinks, blues, yellows and greens for a look that feels tasteful yet fun. 01. // Silicone Rattle; 02. // Pastel Blocks; 03. // Mouse Soft Toy; 04. // Superhero Mouse; 05. // Porcelain Tea Set; 06. // Giraffe; 07. // Jamm Scoot; 08. // Gallop Horse; 09. // City Blocks; 10. // Rabbit Hand Puppet; 11. // School Bus; 12. // Tool Bench; 13. // Rainbow Tunnel; 14. // Tea Trolley; 15. // Baking Playset. A favourite for a reason, black is the toy tone that brings a modern touch to any room. Not only will the clean lines of black and white toys add visual interest, but the high contrast combo is particularly great for developing babies. 01. // Nesting Dolls; 02. // Stacking Game; 03. // Wood Teether; 04. // Rocking Donkey; 05. // Tool Playset; 06. // Tambourine; 07. // Polar Bear; 08. // Stacking Tunnel; 09. // Building Blocks; 10. // Rocking Horse; 11. // Contrast Art Cards; 12. // Ricepapa Plush; 13. // Activity Mat; 14. // Teether Toy; 15. // Teepee. Nothing adds to a room’s light and airy appearance like white-toned accessories—toys included. Don’t be afraid to hunt around for your little ones’ favorite playtime pieces in their colorless counterpart. You’ll be pleasantly surprised to find white toys add some much-needed calm to chaotic kid spaces. 01. // Rocking Horse; 02. // Wooden Camera; 03. // Celia Doll; 04. // Wood Easel; 05. // Mini Guitar; 06. // Canvas Teepee; 07. // Stuffed Bunny; 08. // Teether Rattle; 09. 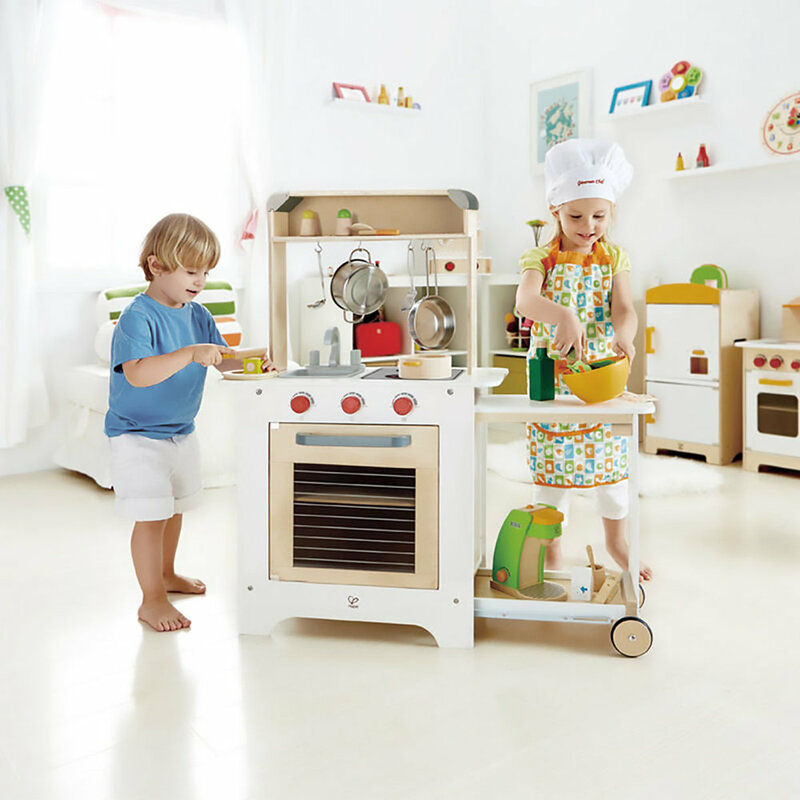 // Play Kitchen; 10. // Modern Slide; 11. // Micro Scooter.